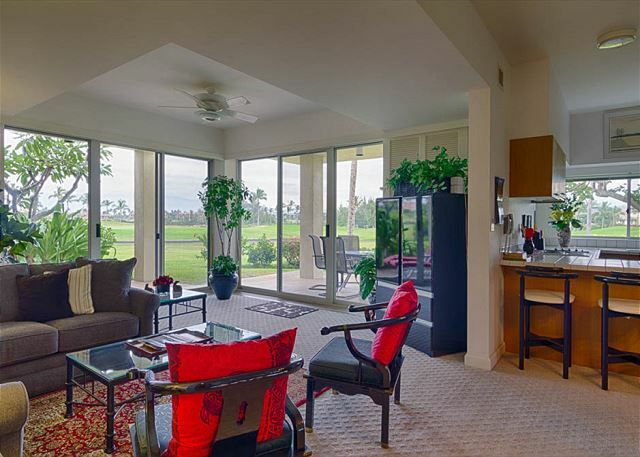 You will love the bright and roomy quality of this popular condo bordering the wide expanse of the Waikoloa Beach Golf Course. 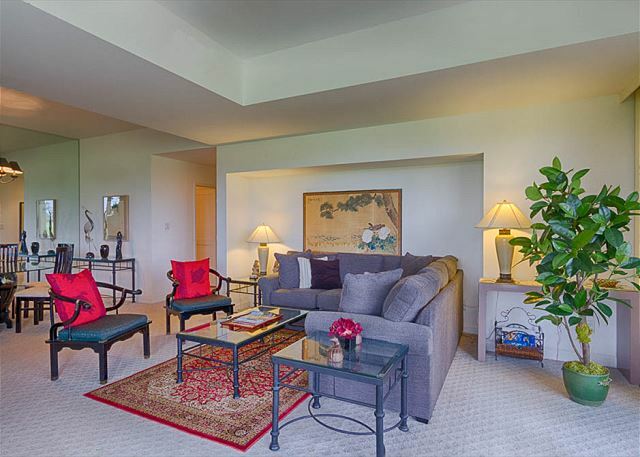 Though perfectly well suited for two people, this condo is ideal for larger groups, having a spacious kitchen with two windows, a private bathroom inside the guest bedroom, lanai access through the master bedroom, and a main-entry foyer. The living room furnishings were recently updated and include a cozy sectional sofa complimented by an elegant tapestry area-rug. Vista F104 is equipped with good amenities such as a full stereo system, quality TVs, an ample supply of kitchen items, a work desk with a printer and office supplies, and many beach items. 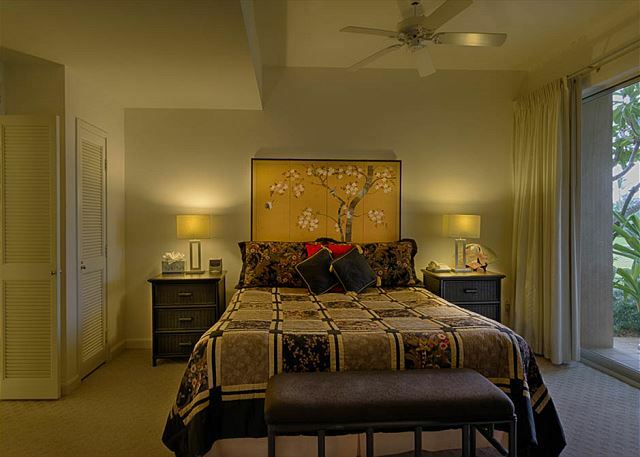 Comfortable beds and luxurious bed coverings will guarantee a restful sleep in this very quiet and private atmosphere. Situated on the uppermost section of the complex, this unit is close to the Kings' Shops for a variety of shops and some fine restaurants, and is also within a 12-minute walk to A-Bay beach through a nearby access path. 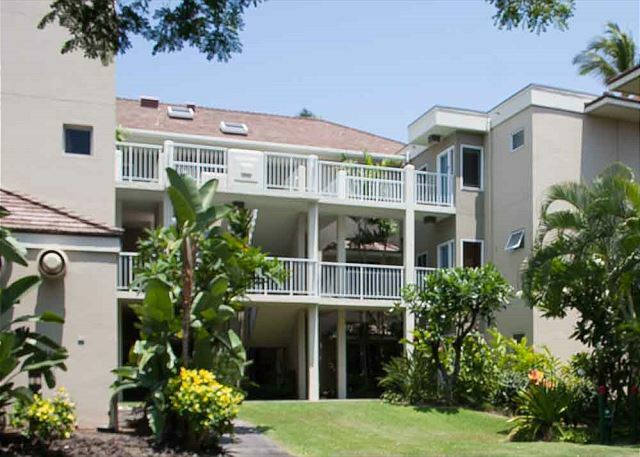 Luaus are accessible at either of the two major hotels that lie within close proximity of the Vista. Great Unit beautifully done. 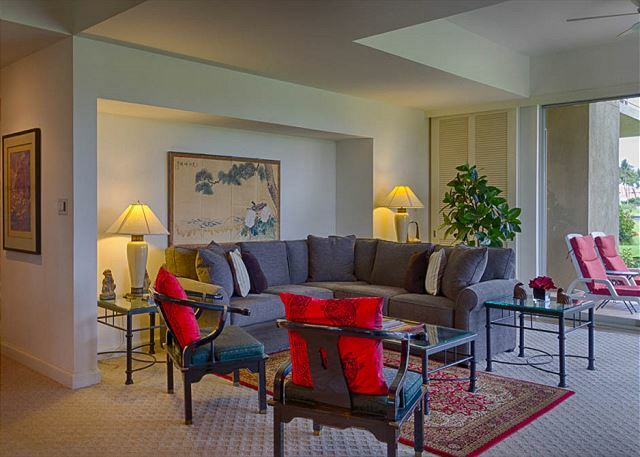 Very Comfortable with serene like golf course views.Onsite Gym and pool were very nice. Super location. 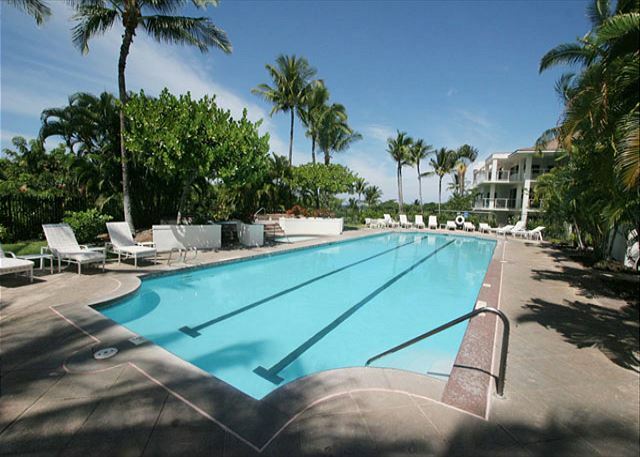 Walking distance to beach, shopping and golf course. Management was very very helpful. A very pleasant stay at this condo. Over all a pleasant relaxing month. We find Peggy a pleasure to work with on arranging for the unit and is very responsive to any request or a maintenance issue. F104 was very well equipped especially the kitchen. There was a tool kit and ample cleaning supplies in the closet. The printer was a great benefit in printing our airline boarding passes. Our family really enjoyed our stay at this spacious and comfortable condo. 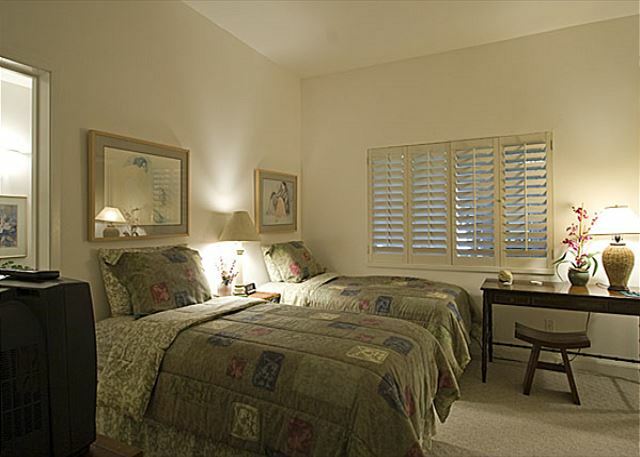 The layout was very family friendly, and the couch and beds were particularly comfortable. We enjoyed being on the ground floor with a sunrise view of Mauna Kea. We could occasionally hear upstairs neighbors, but brought earplugs for sleeping and had no difficulties. The kitchen is adequately stocked with casual dishes and general cooking tools. There was a small cooler that we gratefully used for picnic lunches every day. 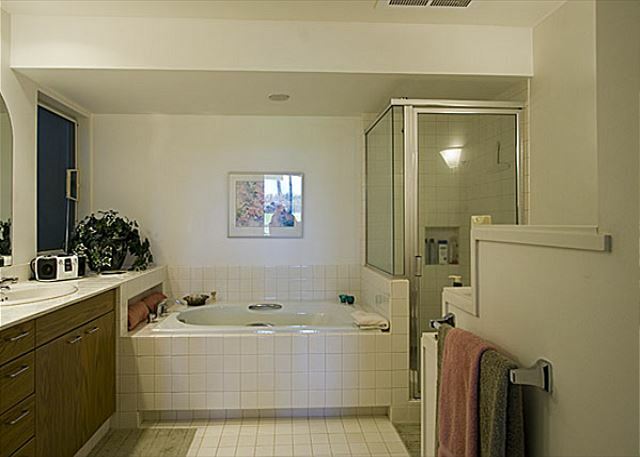 The condo was clean and organized with nice linens and towels. We really appreciated the beach towlels, boogie boards and comfy beach chairs. 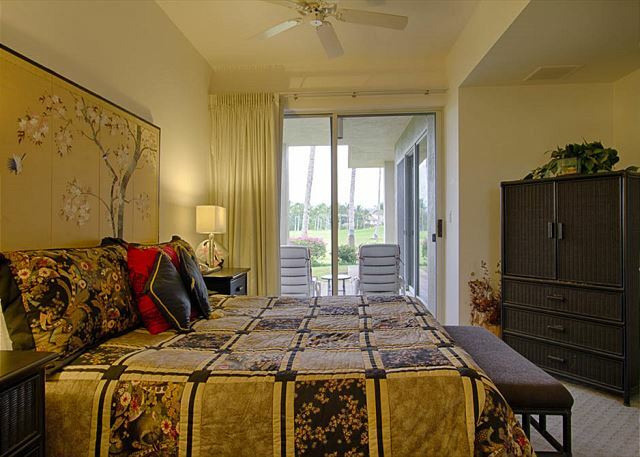 The location on the golf course made the lanai feel very large, and offered a very short walk to neighboring A Bay sunsets or the King's Marketplace. The condo has not been updated, but we found the original kitchen appliances, bathroom sinks, etc more than adequate. The pool and hot tubs were clean and comfortable. They were located on the other side of the complex, but we didn't mind the short walk to and from them. The fitness center was clean and always available. Groundskeepers regularly mowed and tended the numerous blooming bushes and trees on the property. Geckos entertained us while we ate on the lanai. Peggy was very kind and accommodating from booking to checkout. We are already planning our next visit to this lovely vacation home away from home. 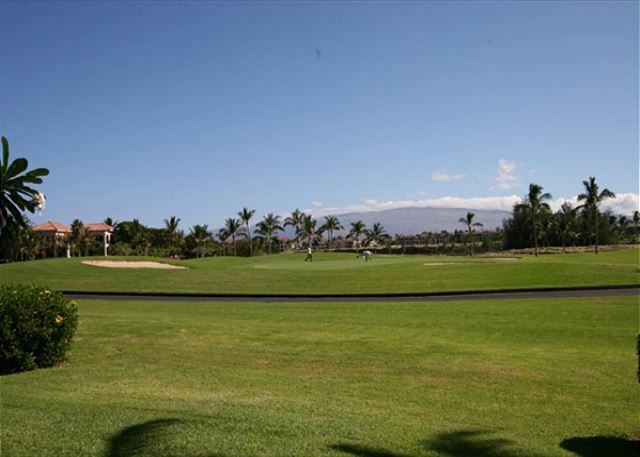 You can't do better than Waikoloa Realty & Vista Waikoloa! 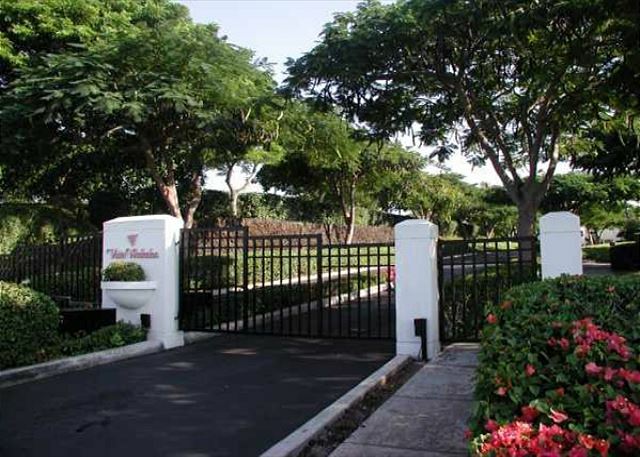 We are repeat customers with Waikoloa Realty & Vista Waikoloa - this was 2nd time we stayed in F104. The unit is roomy & living room furniture is comfortable. Wifi is reliable & reasonably fast. Peggy from Waikoloa Realty is on top of her game - any request we make is taken care of immediately. She even chased down a package from Amazon that had been delivered to the wrong office in their complex! The unit could use new carpets - otherwise very comfortable & 1st floor offers nice access for pictures of the pair of Nene Geese that had 4 young ones on the golf course in front of the F104!! Waikoloa Beach Resort is a great location with easy access to good restaurants & only a short drive to a grocery store in Waikoloa Village. The unit is great, had everything we needed (including a coffee grinder!). This is our second year in this unit, love the location and the unit itself, will definitely be coming back.